Fall is here and I love the cold weather and everything that comes with it. There is something magical about the changing of seasons… but nothing is more magical than pumpkins. Whether in the form of a pumpkin spice latte, pumpkin pie, or a jack-o’-lantern, there is nothing that brings out the spirit of fall like a pumpkin. These bars are gluten free and perfect for a grab and go, filling morning treat. 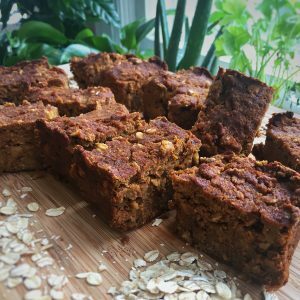 They taste like pumpkin pie, but are nourishing and wholesome. These can either be made in muffin tins or a 10 x 16 in baking pan. Just make sure you grease the pan or tins with vegetable shortening prior to baking. In one large bowl, combine the ground flax seed and water. Let sit for 5 minutes. Combine the remaining ingredients to the bowl and mix until everything is integrated into one batter. Pour the batter into either muffin tins, filling to the top and leveling out with a spoon, or in one flat layer in a 10 x 16 in baking pan. Let cool and store in the fridge overnight. The next morning, remove from pans to be cut or stored.